Monday night’s announcement by St. Louis County Prosecutor Robert McCulloch that police officer Darren Wilson will not be charged is being seen throughout the country and around the world as a judicial travesty. From the beginning, the process leading up to the final decision was rigged for one purpose and one purpose only: to protect the cop who murdered unarmed 18-year-old Michael Brown. Rather than present charges to a judge for an indictment, the state convened a grand jury, replacing a public trial with a secret, closed-door hearing in which the evidence was controlled by the prosecutor’s office, led by an individual with close ties to the police. This was followed by the highly unusual decision by the prosecution not to request and argue for specific charges. Transcripts of the grand jury proceedings reveal clear and evident bias, with prosecutors devoting themselves to discrediting all evidence, including eyewitness testimony, that did not conform to the narrative that was required. Wilson, in contrast, went unchallenged as he presented his own self-serving account over the course of four hours. Throughout the hearings, the prosecutor’s office sought to place Michael Brown, not Darren Wilson, on trial. Grand juries almost invariably file charges that prosecutors seek, and this case was no different. Despite the overwhelming evidence that a crime was committed, the grand jury did not indict because the prosecution did not want an indictment. The whitewash of Wilson’s crimes, however, cannot be explained merely as the result of the misdeeds of McCulloch. The actions of the prosecutor were part of a highly orchestrated political operation, with the close involvement, as McCulloch himself was at pains to emphasize, of the Obama administration. Given the enormous popular anger over the killing of Brown, and the clear legal foundation for a trial, one might ask why the grand jury did not at least return an indictment for a lesser crime, such as manslaughter. Or why an indictment was not delivered and a trial conducted—a trial that, given the sympathies of the prosecution, would have very likely produced the same result: the exoneration of Wilson. In the three months that passed between the killing of Michael Brown and the final decision not to indict, there was no doubt debate behind the scenes over these different possibilities. Two factors explain the thinking of the ruling class in reaching the decision that it did. There is, first of all, the element of provocation. The ruling class has seized on the events in Ferguson as an opportunity to establish new precedents for repression in the United States. Indeed, the timing of the announcement of the grand jury decision, in the late evening, seems to have been deliberately calculated to create the best conditions for police violence. In an escalation of the response to the protests in August, riot police armed with automatic weapons and armored vehicles, firing bean bags and tear gas, patrolled the streets Monday night. On Tuesday, Missouri Governor Jay Nixon—who declared a preemptive state of emergency a week before the grand jury decision—announced that 2,200 members of National Guard, a branch of the Armed Forces, would be deployed directly against protesters. An American city is effectively being occupied. Second, the decision has the character of the ruling class circling the wagons. Whatever different tactical possibilities were discussed, in the end a decision was made that, in the face of mounting social unrest, there could be no concessions, for any concession would be seen as a sign of weakness and only encourage more opposition. Yet in defending its rule through violence, the ruling class is only further discrediting itself before the entire world. A state that has organized wars in every region of the globe, invariably justified on the basis of defending human rights, employs the most brutal forms of repression against opposition within its borders. The New York Times, speaking on behalf of sections of the Democratic Party, worries in an editorial posted Tuesday that the “scarred streets of St. Louis—and the outrage that continues to reverberate across the country…show once again that distrust of law enforcement presents a grave danger to the civic fabric of the United States.” This “grave danger” has been fueled, the Times writes, by the decision not to indict Wilson. While these comments are generally framed in racial terms, the underlying issue is class. The ruling class is well aware that the policies it is pursuing—endless war abroad and social counterrevolution at home—are deeply unpopular. By a “grave danger to the civic fabric,” the Times means uncontrollable social unrest, even revolution. While aware of seething social discontent, the ruling class has nothing to offer. 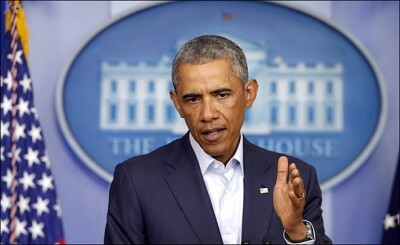 The Times itself places its criticism of the grand jury decision within the framework of praise for the role of Obama, as if his administration were not central to both the outcome in Ferguson and the broader political crisis facing the American ruling class. Six years of the Obama administration have not gone unnoticed. Millions of workers and young people in the United States have begun to draw the conclusion that there is no mechanism within the existing social and political system to address their concerns or express their opposition. This understanding has only been further confirmed by the exoneration of Darren Wilson. These are the hallmarks of a system that is heading inexorably toward ruin.